What is this Blockchain Thing? I live in the world of blockchain and smart contracts. And I hear people using terms that remind me of when we were building the Web back in the 1990s: they are talking, but they aren’t understanding each other, because they don’t have a common understanding of the terms of a new technological order. The worst part is not that they don’t understand each other but that they think they do understand each other! Here, I’d like to offer a few basic definitions from my keynote speech that I hope will help people get on the same page and collaborate. A blockchain is a shared ledger that everyone trusts to be accurate forever. Let me unpack that. First, it has nothing to do with blocks and chains. If you hear someone answer the question by talking about blocks and chains, I submit that this person doesn’t get it. Yes, we have blocks and chains today, but the blocks and chains don’t matter. When we have $500 billion in value stored on shared ledgers, I hope there will be no blocks and chains involved. The key is the shared ledger. What’s a ledger? It’s a record of transactions. That’s it. That’s the “one simple trick” for changing the world completely, from top-down hierarchical institutions to autonomy, freedom, and self-determination. How? Sharing a ledger means we don’t both keep our own books, but rather we share a common set of books. We trust each other to keep a record of transactions that we both believe represents the truth. Magically, this enables us to get rid of banks, insurance companies, most government institutions, and even media companies. I’ll expand on that a bit more in another essay, but you can read many of the use cases on my web site, www.decentralstation.com. I said everyone trusts this shared ledger to be accurate, and that includes people who don’t trust each other. So the blockchain and smart contracts are called “the trust machine,” because we no longer have to rely on third parties to help us conduct business. Make a list of everything banks to. It comes down to trust — right? The rest is mechanics. We trust them to help us manage our money. How well has that worked out? How many billions have the top banks been fined for screwing their customers to increase fees? Many. Every bank is now under heavy pressure to reduce head count and improve profits. We can do all those things now without banks, thanks to the trust we have in smart contracts. Forever. Forever is a long time. We call the blockchain “immutable,” because it would take something like $1 billion to hijack the bitcoin blockchain today and start changing records of past transactions. While it’s not impossible to do, it is very difficult to see how you’d make any money on that $1b investment. Because it’s an impractical use of hundreds of millions of dollars, we don’t expect anyone to change the record. In the future, when billions of records are on the blockchain, and when the blocks and chains are all gone, we’ll use trusted systems to execute smart contracts that will be as commonplace as using PayPal or ApplePay today. The difference will be that there won’t be any large institutions or fees involved. What Can you Do with a Blockchain? I mentioned smart contracts, which I will unpack in another essay. But the short version is: smart contracts let us program the assets on the blockchain, from cryptocurrencies to gold to diamonds to land to stocks and bonds and many other valuable things. One way we say it is that the blockchain represents programmable money. If you can program money, you can replace most white collar workers with software. At my new company, that’s exactly what we’re working on. DecentralStation.com — my online starting point for your deep dive into the world of blockchain. Twenty Thirty — my new company, which is completely run on volunteer power and we’re having a great time changing the world. 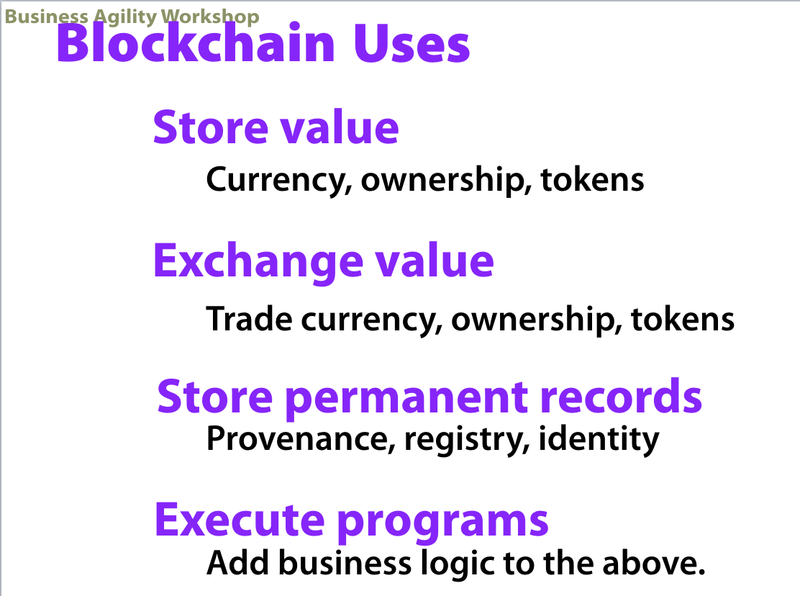 BusinessAgilityWorkshop — this site is dedicated to helping people build a decentralized, agile mindset. There are plenty of essays and short videos here. The Culture Deck — A well-referenced essay on the 24 aspects of culture you can start changing today that will lead you to a more vibrant, autonomous culture that can thrive on change. Feel free to leave comments and ask me what you’d like to learn about. I believe that William Mougayar is correct when he says that all technological shifts are much more about attitude, culture, and business process change than they are about the actual new technology. Once you see the world from a more adaptive, agile mindset, you’ll see that the blockchain really is going to change everything forever.